Problems with "Burying the Knot"
A big goof, that's what. When I come to the end of a thread and tie off, I "bury the knot" - which basically means pulling the thread a bit tight, tying off, and then pulling so that the knot pops inside the top/batting/back sandwich, effectively hiding it from view. 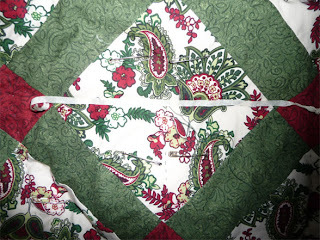 But as I've been working on this quilt, I've pulled too tightly - and thus causing the knot to pop too far in, actually removing a stitch in this case. Clearly I'm going to need to take a lighter hand with this as I continue, or the back is going to look pretty awful. So there you go - another lesson learned. "Layer Cakes" and "Charm Squares"
Oh, a whole new way to blow my budget. There are 36 different prints in this package. Some packs come with more, some less, so it's important to pay attention when you're buying them; you could end up with less than you think you have. 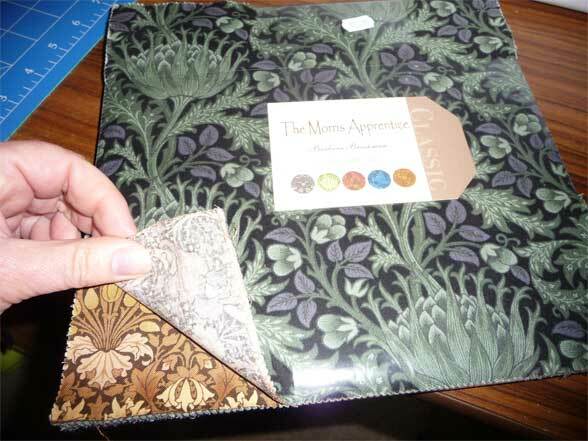 It's a stack of 42 different "William Morris" prints. 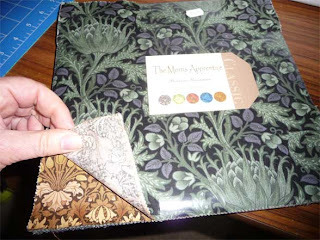 I showed these to my friend Julie, who instantly recognized the designs - and who told me about William Morris (1834-1896). He was a poet and political activist, but also famous as an English designer of the Victorian era. His nature-inspired wallpaper and textile designs were very popular in Victorian homes. 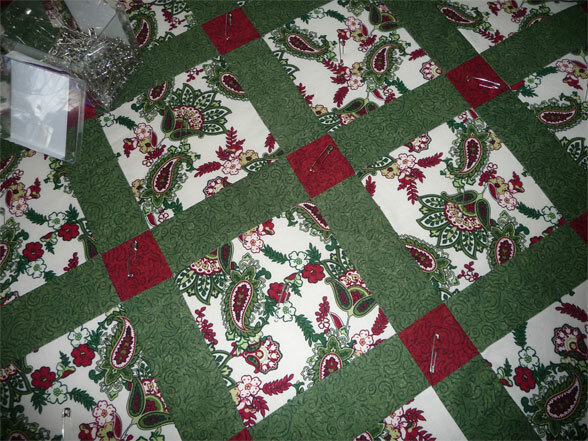 I'm still stitching away on the Christmas quilt, having decided to go ahead and finish it now, rather than pack it away, unfinished, for next Christmas. But as I'm working on that, I'm thinking about these William Morris prints, especially, and will most likely make those my next project. I'm thinking about another queen-size bedspread. 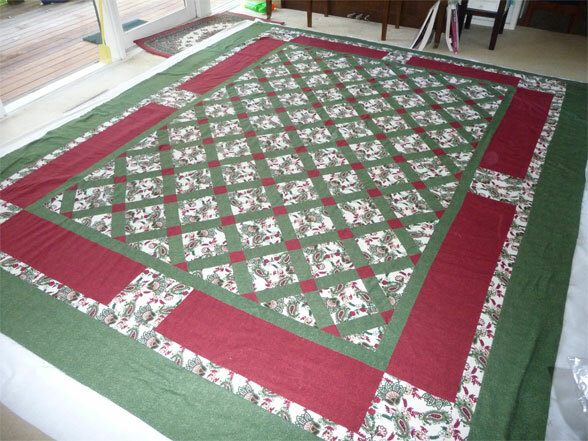 My good friend Jen has been a great supporter of my quilting habit, cheering me on over the last couple of years. She's also been very encouraging about this blog, often emailing me to remark about something I've said here. How's that for a first project? Pretty amazing, I'd say! I'm so proud of her - and tickled to think I may have been a "bad influence" on her. 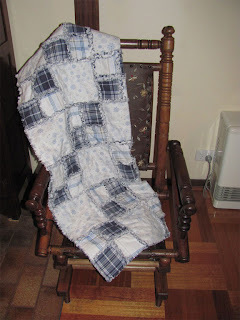 Oh... and notice the little antique rocking chair she's draped her project over? THAT's also one of her projects - she does wood work, and repaired the chair last year - is there anything she can't do? A couple of years ago, when I first started quilting, I went to a local quilting shop and had a chat with one of the gals working there. I asked her to suggest helpful tools. 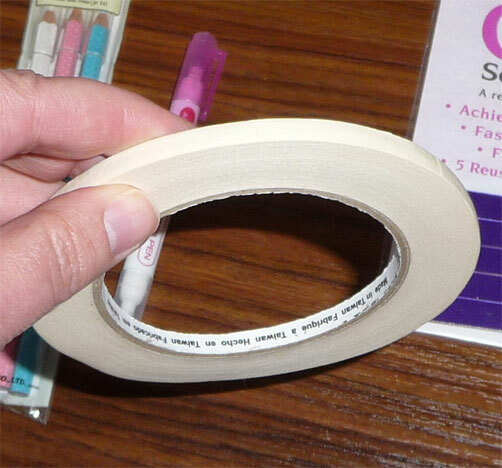 She was very helpful and one of the things she suggested was this very then roll of special masking tape. And boy, am I ever glad I've got it. I'm quilting my Christmas bedspread project now, and decided to do simple straight lines from point to point. 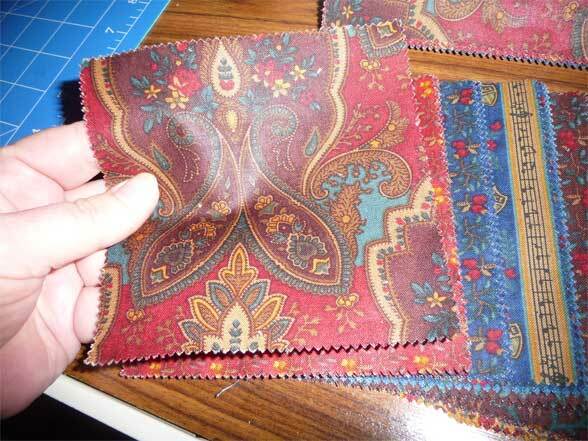 The small red blocks are easy - but the wider "paisley" blocks are too big to get across without some kind of guide. This tape is fabulous. I just lay a little strip along the line I want to keep, press it into position and stitch away. Then, when I reach the end of the block, I can pick up the tape and use it in the next wide block. The tape eventually stretches out and gets too wobbly to work with, but a single strip lasts quite a long time. Using it keeps my stitches straight without having to bother with a marking pen or chalk. Here we are! 2013 already! I wonder how long it will take for me to get used to writing "13" as the year. Probably about a month. Quilt 4 is still my focus I haven't decided whether to continue working on it a while or just box it up and take it out next year when Christmas time rolls around. 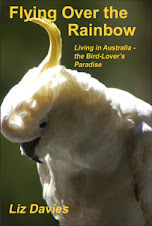 For the moment, I'm continuing to work on it. These photos are from just before Christmas; I did the assembly I'm showing you then and have been working on the hand quilting since. 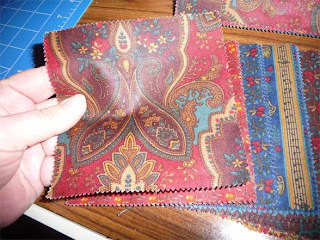 Here's my backing fabric (below). 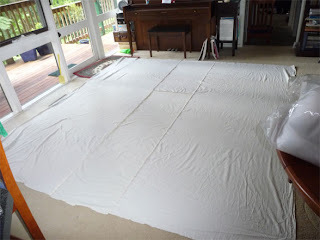 I prefer to back my quilts with a print, but for a queen-size bedspread, well... it's awfully expensive to do that - and as it's a spread and not just a "throw" (where you'd see the back) it just doesn't seem worth the cost. 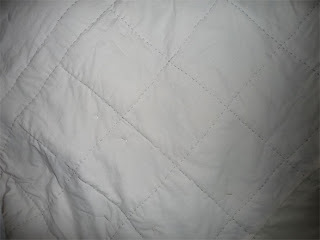 So, as I've done with my other bedspread size quilts, I'm backing it with plain "homespun" cotton. I moved all the furniture out the the way - had to because of the size of this monster! Then I smoothed and smoothed as much as I could. 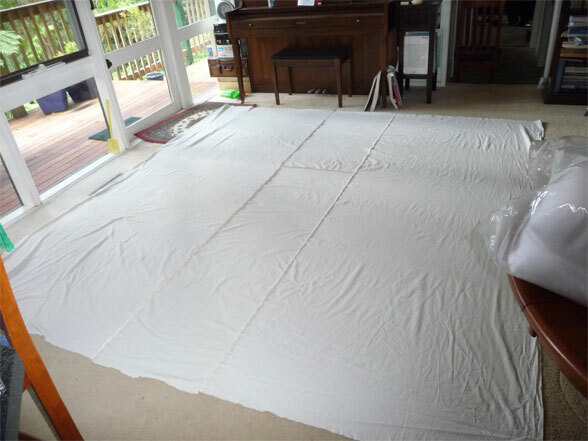 Next I put the batting down (king size batting, as this quilt is almost that size - I had about 18" of excess on one side after the sandwiching,which I trimmed and will use for placemats and/or table runners later). I used every pin I've got and just barely managed to get the whole thing pinned. I'd have liked the pins to be closer together, but hopefully I'll be OK with them as they are. 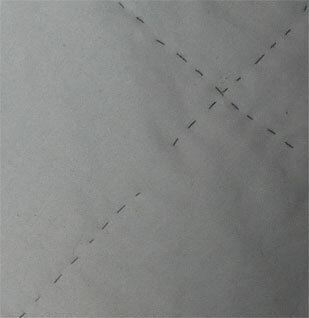 I'm planning to do mostly straight-line stitching, so it should be OK. I've been thinking what colour thread to use for the hand quilting. I was really on the fence about it, so I contacted Pauline, my quilt guru. She quickly suggested dark green. At first I wasn't sure, but I took some small scraps with me to the store when I went to buy the thread and... well.. she sure was right! So dark green it is! A nice bonus is that the dark green will show up beautifully on the back (with the cream backing), so the back will look interesting when it's flipped over.